Dulled feelings reawaken. Classic 1920 is a fragrance that sets desire and mystery to rhythm. The fragrance is built in the wake of harmonious spicy notes that are smoothed by a complex flowery bouquet and elegant fruity nuances. 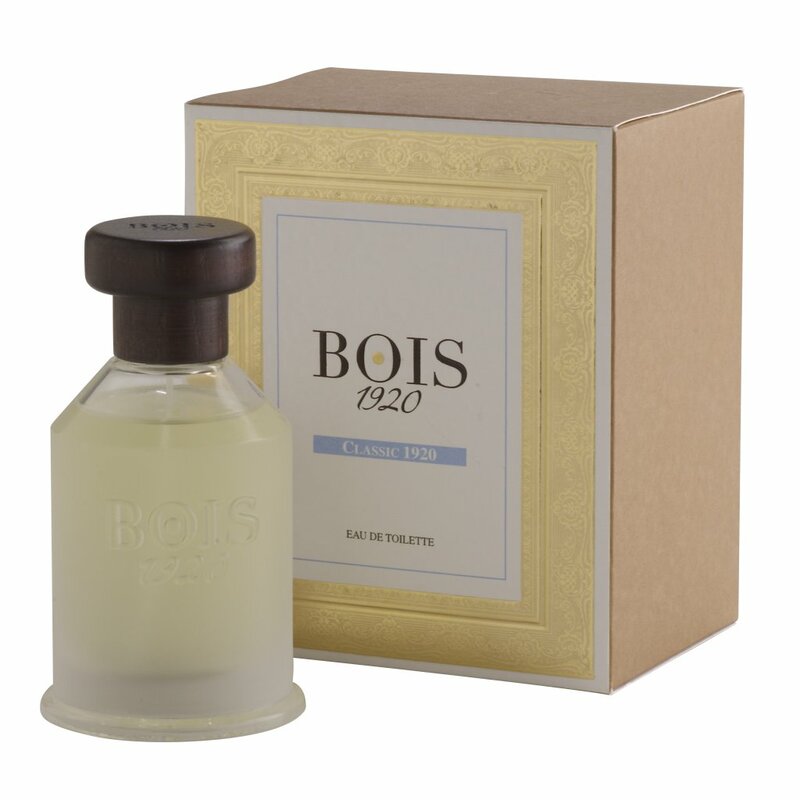 At the end, the green and boisé [woody] base notes of vetiver from Haiti and citron from China slide gently into the exotic enchantment of sandalwood from the Antilles. After reading that, I was determined not to like Classic 1920, but damned if it didn't seduce me anyway. Plenty of amorphous spice in the citrusy top, a big indefinable and genderless floral mix sharpened with vetiver in the middle, woody amber in the base: not particularly original, but I enjoyed wearing it, and throughout the day little currents of it would waft up and make me smile, which is just about the best possible reason to wear a scent. At $195 for 100 mL, though, I can't see that it's worth what they're asking, unless you were determined to make it your signature scent (which it would do admirably). It's nice, but it's not a couple hundred bucks' worth of nice. Hunt down some Perry Ellis Reserve (discontinued but widely available online) instead: it's the same basic idea, a big masculine floral wrapped in a spicy-green amber oriental, and it won't break the bank. 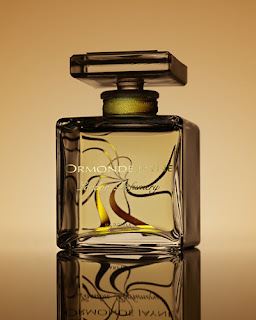 I could reach for a way to draw a connection between Osmanthus and Champaca, but the fact is that I opened my box of Ormonde Jayne samples and couldn't decide which of the soliflores I'd like to try, so I chose two. 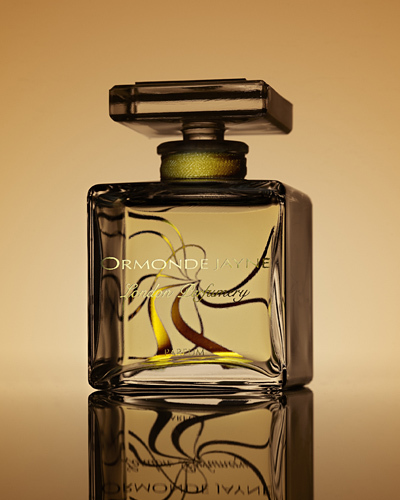 Ormonde Jayne Osmanthus has a property you occasionally notice in other scents: it smells very different in different quantities. A tiny amount of it on your skin smells rather nice, if fundamentally uninteresting: it naturally has little projection, because there's not much of it, so you have to get up pretty close to smell it, and when you do, what you will smell is a bright apricot floral with a plush opening rapidly cut through with a knife of vetiver. Ten minutes after that it settles down and becomes dull, which is where it remains. If you spray it on with some abandon, it immediately becomes a vulgar fruity floral, from which it never recovers. It's not cheap (currently £80, about $125), and it isn't made with cheap ingredients, but it smells cheap, which is worse than if it actually were cheap. Champaca, on the other hand, barely reads as a floral at all, and in fact flirts with outright weirdness. After a brief whiff of suntan lotion, it turns into a heavily peppered bowl of milky rice pudding, hot from the oven, garlanded with freesia. It smells even more like rice pudding than did Kenzo Amour, and clearly owes a debt to the mad-genius Le Feu d'Issey, with its creamy-buttery roses. I can't tell if I like it, exactly, but it's interesting, I'll give it that, and unlike Osmanthus, I'll be wearing it again, because I like a dollop of strangeness in my scents. I will not, however, be wearing this to dinner, because, like Le Feu d'Issey, it overwhelms food: you can't really smell anything else, and you'll fancy you can actually taste it. Earlier this month I wrote about Serge Lutens' De Profundis, which is supposed to be about death in an abstract way, and Etat Libre d'Orange's Charogne is a play on the same theme, but the intention is more literal: "charogne" means "carrion", the body of a dead animal. While Lutens scents are usually peculiar in the service of a bigger idea (Miel de Bois, say), Etat Libre d'Orange scents seem to be peculiar for the sake of their own peculiarity: sometimes I think they came up with a name or a concept and forced the scent to fit that, and other times it seems as if the perfumer had said, "Why don't we try this for the pure hell of it? ", and then they just bottled the result. Sometimes it works, as when they grafted a candy-and-baby-powder accord onto a leather-coffee-tobacco base in Divin'Enfant: sometimes it doesn't, as it didn't in the baffling Encens et Bubblegum, to name just one. I can't tell if Charogne works or not: it's off-putting in a way that is hard to pin down in words. (It took me a whole week to get this far with it.) I like it and then I don't, I want to wear it again but then I want to scrub it off, or at least be wearing something else, but I keep coming back to it. 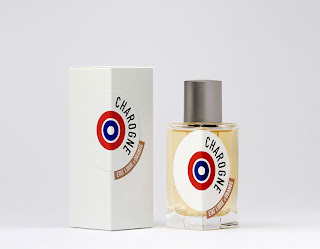 As for what Charogne actually smells like: not carrion! There's decomposition in it, but floral, not animal: a bowl of plastic-wrapped candy and a plastic-wrapped bouquet of flowers (mostly funeral lilies) a couple of days past their sell-by date sitting in a funeral home permeated with incense fumes. The synthetic plastickiness is not only obvious but clearly deliberate. It is sweet, in the way that overripe flowers and fruit are sweet, and the incense has a spiciness to it which doesn't cut through the sweetness but amplifies it, like eating a whole loaf of cinnamon-raisin bread. There is a suggestion of leather near the end, but it's more like Naugahyde seat covers than real leather: you wouldn't call this a leather scent, that's for sure — maybe a floral oriental, or a straight-up oriental. Or maybe it's just in a nameless category all its own. It is just the damnedest thing: I wear it and wear it but can't tell if I like Charogne or not. It really is a puzzle. You should try it, though. I am pretty sure you've never smelled anything quite like it. Six years. I have been doing this for six years. When she left Aubazine to make her fortune, the girl who was not yet Coco Chanel had no idea that she wanted to create a perfume. She had no idea yet even of becoming a fashion designer. Gabrielle Chanel had no thought yet of creating a signature perfume — no thought yet even of creating her innovative fashions, let alone a couture fragrance. One day she, too, would open a shop and give the world its most famous fragrance. In her early twenties, however, that idea hadn't yet occurred to her. Honestly. "As a schoolboy in Rome, young Enrico Fermi had no idea he would grow up to be the father of the atomic bomb." Parts of "The Secret of Chanel No. 5" are fascinating, but there's too much speculation, too much padding (you get the sense that the book was originally half as long), too much dogged insistence on the notion that every event in Chanel's life somehow led inexorably to Chanel No. 5, and much too much foreshadowing. I was going to write about Chanel No. 5 until I discovered that I don't seem to have any. I was pretty certain that I had a spray vial of the EDT or EDP lying around somewhere, and I still think I do, but I can't find it, and I'm not going to go out and buy some (and if I were, it would be the extrait, which is by far the best of the three versions). 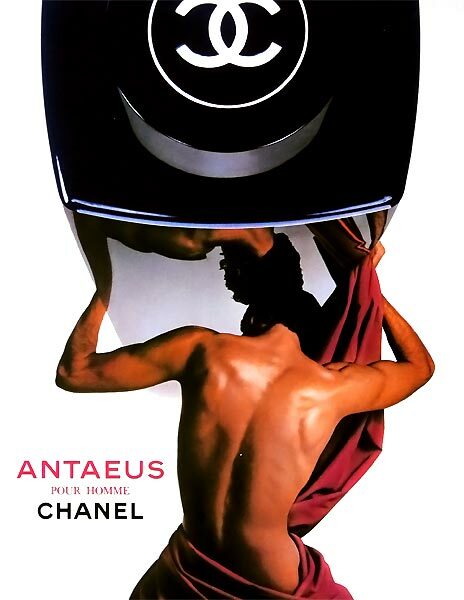 In fact, the only Chanel I have in any quantity that I haven't written about yet is Antaeus. It won't take much writing, either. 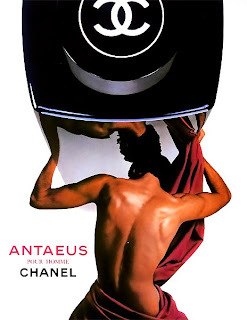 Antaeus was launched in 1981 as an herbal leather chypre, and those three words define it completely. The top is briefly green and immediately supplemented by a big horsey leather, all saddles and spurs, which gradually gives way to a classic leather-patchouli-oakmoss chypre base. It is not in style any more, but it is flawless. It lasts for hours upon hours, and it radiates confidence and charisma. 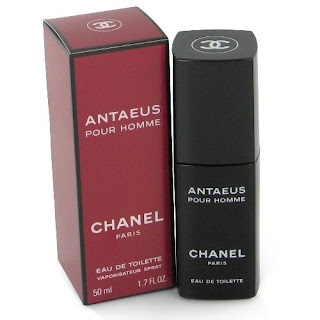 The world would be a better place if a lot more men smelled like Antaeus all the time. Antaeus was a giant (or half-giant) of Greek myth whose superpower was that he was undefeatable as long as he was touching the Earth: because there is always a catch in Greek mythology, he was killed by Hercules, who picked him up off the ground and crushed him like a milk carton. This explains the ad above. As usual, I don't know how old my Antaeus is (it's certainly ten years old), and so I don't know what you would smell if you went into a store and sprayed some on your skin today. It's surely been reformulated to delete the oakmoss: maybe what's out there right now is good, but I doubt it can compare to the original. If you can get some of the older stuff, you are in for a treat. If my scanner were working properly, I would post a scan of a Lynda Barry cartoon, but instead I will just have to describe it for you: in one of her early autobiographical cartoons she tells of hand-knitting while in high school a lime-green maxi skirt, which she is wearing as she stares dubiously into the mirror and thinks, "Maybe this is really cool and I just can't tell." I have that problem all the time and I don't suppose I'm alone. Not the lime-green maxi skirt: the not quite knowing if something is good or not. It is enormously difficult for me to distance myself from my opinion of something — which is generally strong and immediate and unalterable — and try to imagine how other people would react to it or how it might be perceived in an objective manner. And so it is with De Profundis, Serge Lutens' most recent scent. 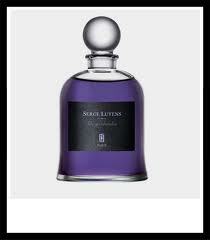 I am disposed to like Lutens: I love or at least appreciate most of his fragrances, because they are interesting and thought-through and unlike other things on the market. But I really dislike De Profundis, and I can't tell if it's because it's objectively bad or because it's just not the sort of thing I like. I dislike it so much, in fact, that I'm not wearing it right now but just coasting on memory of the last half-dozen times I wore it to try to get a handle on it. Maybe it's terrific. Maybe it's even genius, as so many Lutens scents are. Maybe I just can't tell. De Profundis is supposed to be inspired by death — the name is from Psalm 130, traditionally recited at funerals — which I guess explains the funereal look of the amethyst liquid and ink-black label. The scent itself is, if nothing else, a lesson in the uselessness of describing a fragrance as "floral", because it's floral, all right, but if you think of florals as cheerful or feminine or airy or innocent or romantic or fun or any combination of those things, well, De Profundis will disabuse you of that notion quickly enough. It is tinged with incense and bitter greenery but mostly it's a floral inspired by the chrysanthemum, a flower without a particularly strong scent of its own (and not a very agreeable one in any case). There is a hint of carnation to it; otherwise the flowers are not really identifiable. If you packed a barn to the rafters with flowers bred for longevity and not a lovely scent, held a funeral service there, and then emptied it out and scrubbed it down with an industrial-strength cleaner, what remained would be the scent of De Profundis. I cannot imagine wanting to smell like that.